Bright light therapy is the therapy of choice for those suffering from Seasonal Affective Disorder (SAD). It helps 80% of those with SAD get relief from their symptoms, including depression and lethargy. Some have also reported that bright light therapy helps lower high blood pressure, aids with insomnia, jet lag and migraine headaches. While bright light therapy takes a couple of weeks to work for some people, many have reported positive results within three days of starting light therapy. Researchers believe that SAD is brought on by the lack of sun and the shorter days in the late fall and winter. When a person sits near the light in light therapy, the light mimics the sunlight and works on the chemicals in the brain that regulate mood. One belief is that SAD happens when a person’s inner biological clock is disturbed. It is believed that the suprachiasmatic nucleus (SCN), is the master biological clock’s probable site in the body. The SCN receives information to do with the amount of light coming in through the eyes. With this information, the SCN coordinates your internal rhythm, regulates your sleep schedule and mood by sending information to the brain. Bright light therapy may help reset this information, helping a person return to their normal functioning. With bright light therapy, users sit near a box containing fluorescent bulbs and a diffusing screen for a treatment session. Generally, treatment consists of exposure to the light on a daily basis for a minimum of 15 minutes, usually first thing in the morning. One can do an activity, such as read a newspaper, book or eat a meal, while sitting near the light. 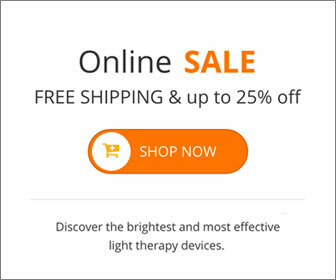 There are very few side effects to trying bright light therapy to relieve SAD, or non-seasonal depression, and there are no known long-term effects associated with this type of therapy. Anyone with a medical condition or with bipolar disorder should check with a doctor before starting therapy. This entry was posted on Saturday, March 29th, 2014 at 1:08 am	and is filed under Light Therapy. You can follow any responses to this entry through the RSS 2.0 feed.